Specifically for recipes. Mine and others. 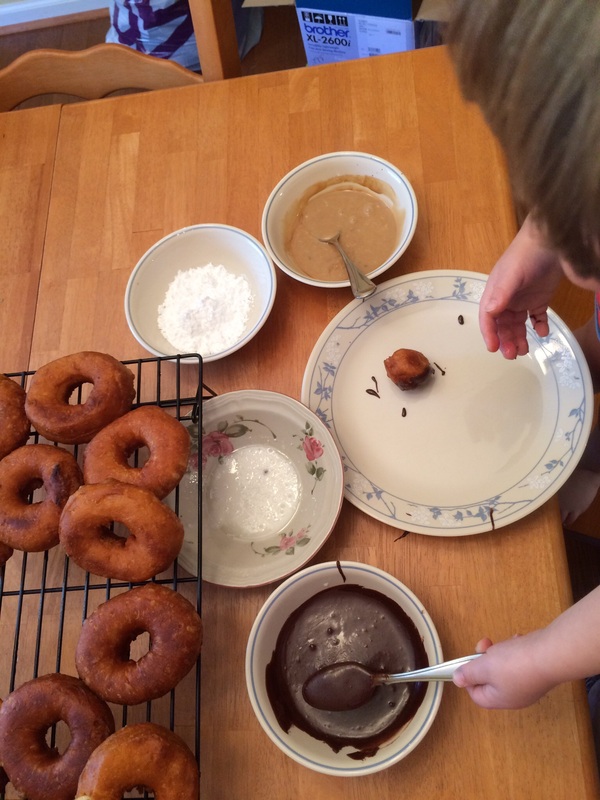 My mother used to make us donuts at home. They were delicious. She’d mix the dough and spend the time to deep fry them. Then, we’d all choose our toppings from an array that she’d mix up from a base powdered sugar mixture. It’s one of my favorite memories from childhood. I decided this would be one of the memories The Boy would have of his childhood. 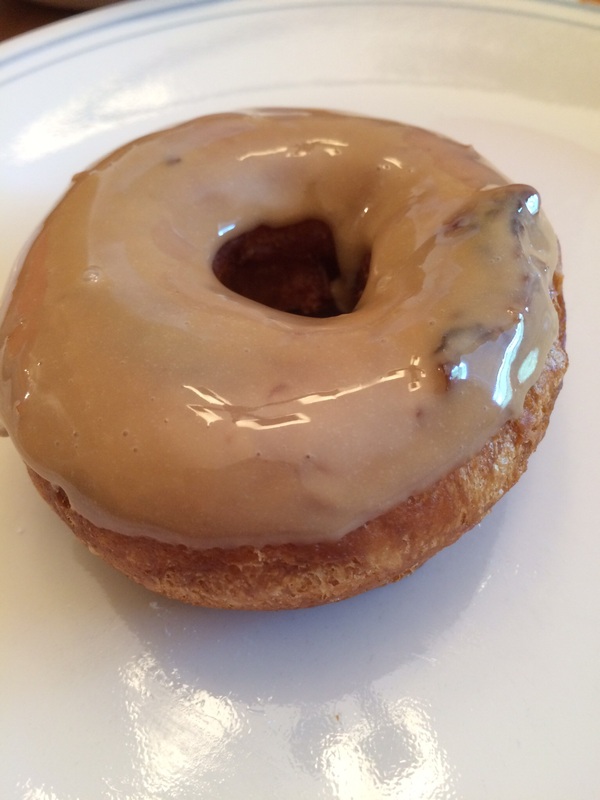 But I don’t have the time or inclination to mix up donut dough from scratch. Thankfully, cans of Pillsbury Grands Homestyle Biscuits exist. In a pan of hot oil, drop the donuts and donut holes a few at a time. Flip after they are golden brown on the bottom. After frying on both sides, remove from the oil and drain. While the donuts are still warm, dip them in your favorite toppings. Split the plain glaze into several bowls, depending on what flavors you like. 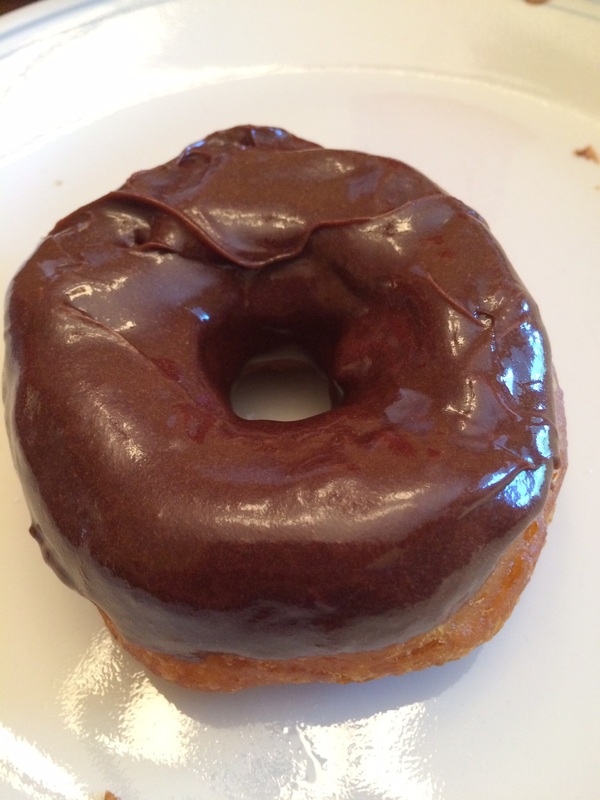 On the third, add cocoa powder (if you’re out of cocoa powder, a chocolate can of cake frosting microwaved for a few seconds until it’s melted makes an AMAZING chocolate frosting for donuts. That is what the chocolate donut above is covered in). Line the bowls up into an assembly line and let everyone choose their own toppings. I needed something easy to make but interesting for our Memorial Day picnic at church recently. I had eaten some brownie pops that my best friend sent me from Shari’s Berries for Valentine’s Day and was craving them again. The brownie pops they created were adorably cute (and extremely delicious) lady bugs where the head was a dipped cherry. 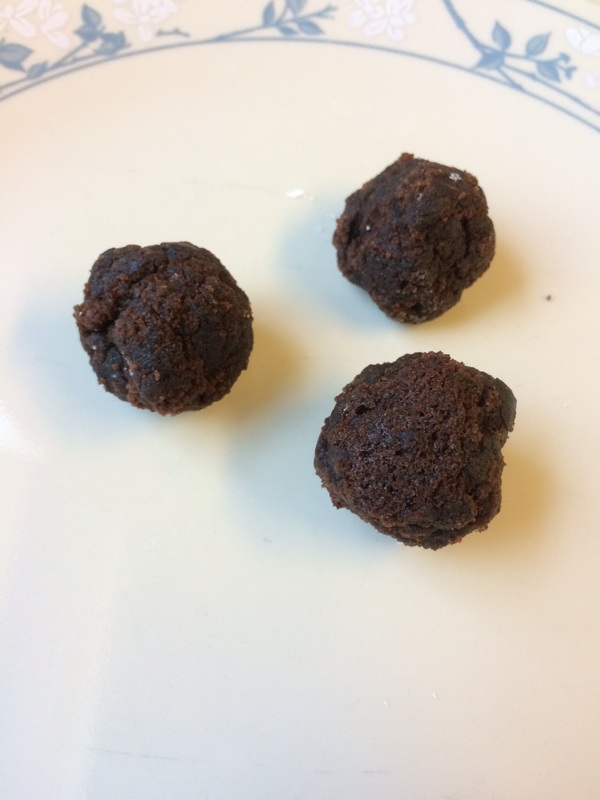 My brownie pops were very simple since I didn’t have a lot of time to make anything complicated, but it would be fairly easy to do more with these. If you are looking for a place to order from though, I can tell you the quality from these and the chocolate covered strawberries she sent me were great. Brownies (I just made a box mix) – make sure you bake them for the bare minimum time so they are still gooey. 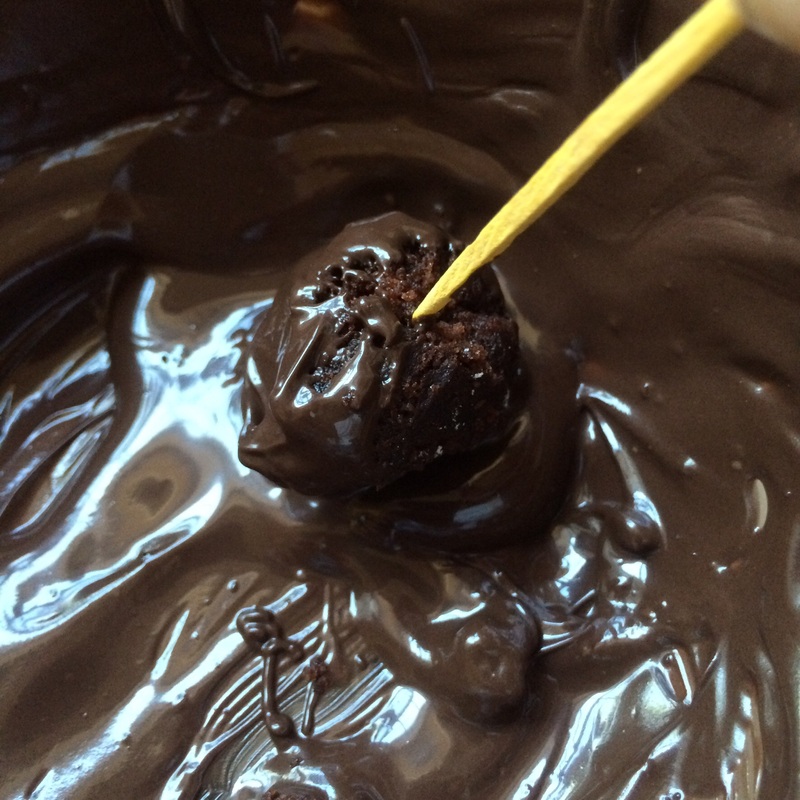 Dipping chocolate – there are many brands, follow the instructions for melting the pieces. I used Marzetti’s chocolate fruit dipping pieces because that was what I had at home. Cut off the edges and scrape the brownie out of the pan immediately after removing it from the oven. Put it in the refrigerator for a few minutes to cool it off, enough so you can handle it, but take it out while still warm. Refrigerate or freeze the balls when done to firm them up. 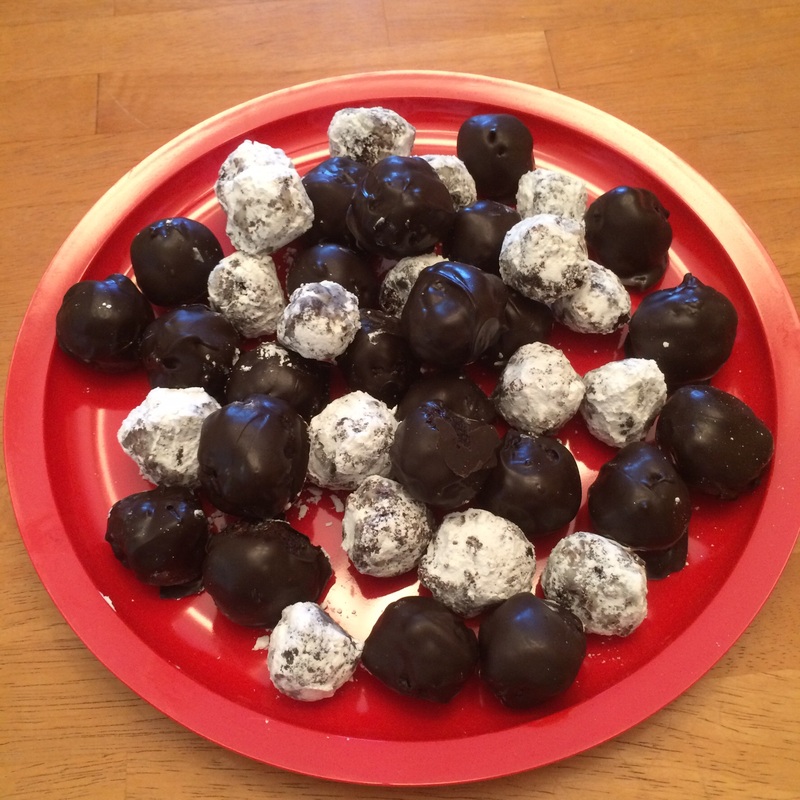 Take 1/2 of the balls for dipping in chocolate and the other 1/2 for dipping in powdered sugar. Using tooth picks, roll the balls in your chocolate dipping sauce. Put them on the waxed paper covered cookie sheet to drip. After you are finished dipping all the chocolate balls, put this pan in the refrigerator to firm up the chocolate completely. 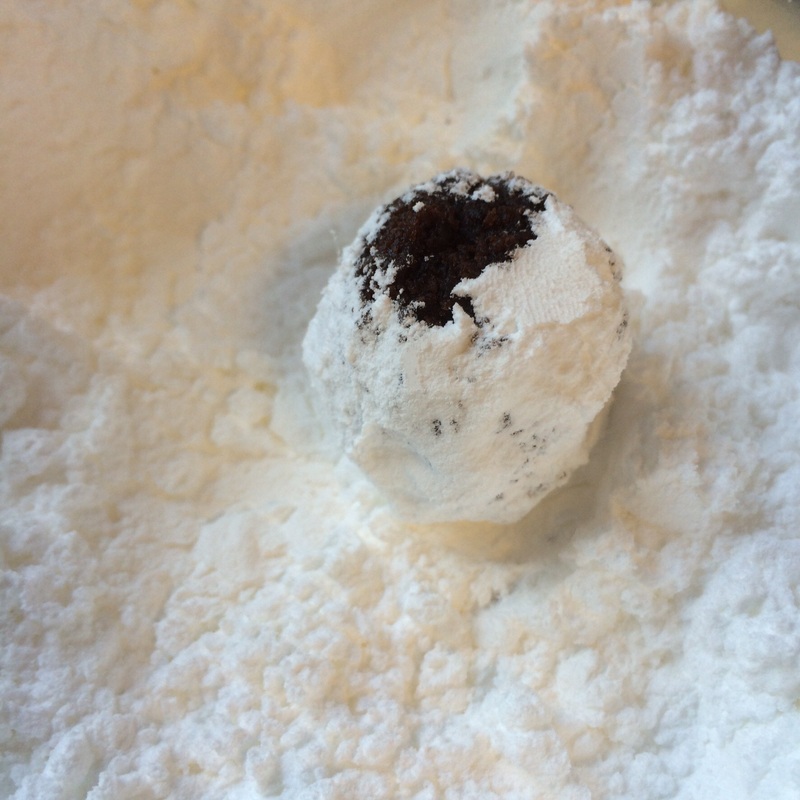 Take the rest of the balls and roll them in the powdered sugar. 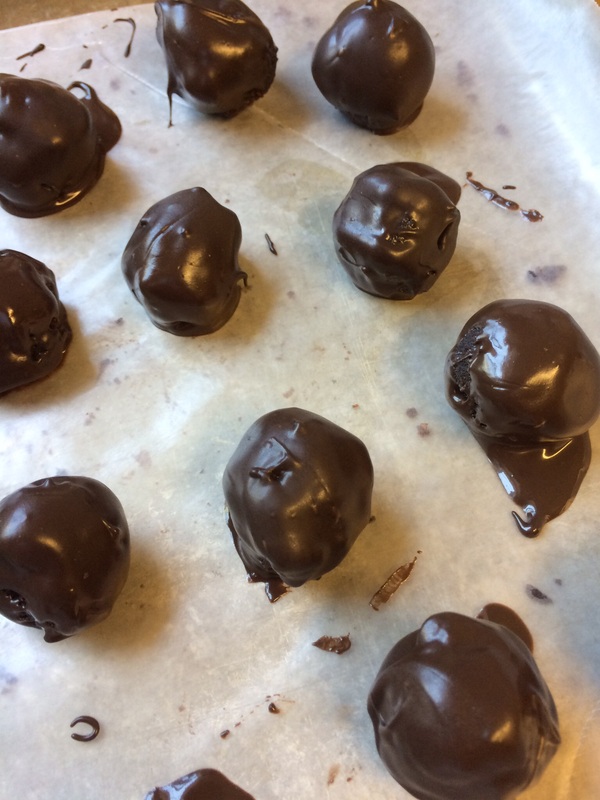 After the chocolate balls are firmed up, place all of them on the plate and enjoy! 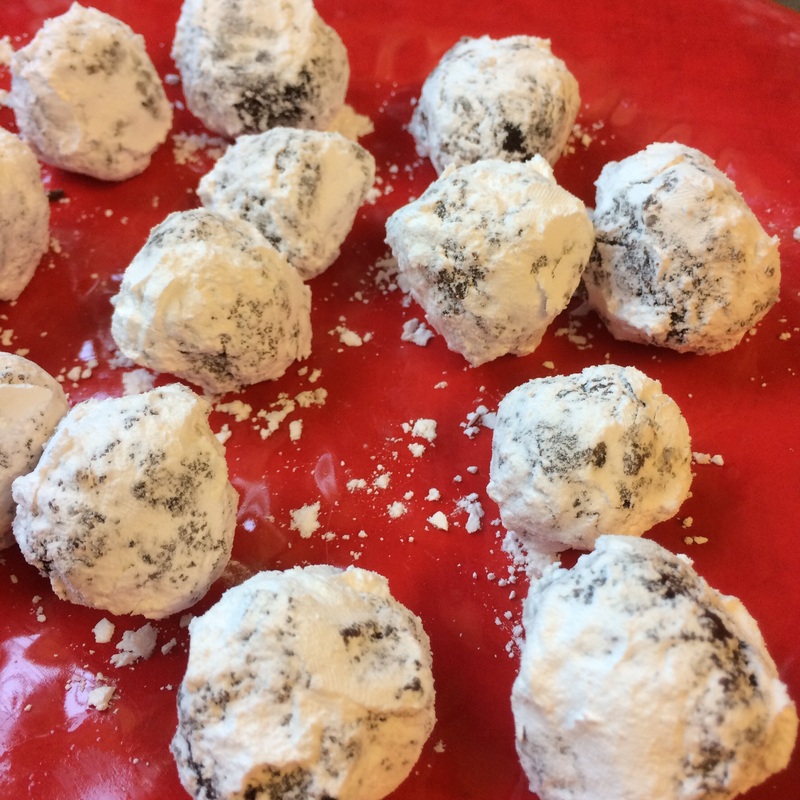 Tip: The chocolate covered balls did eventually start to get a bit sticky in our summer heat, though the powdered sugar ones did fine. But this would probably be better for an indoor party. I don’t cook often, but I do enjoy it every once in a while. When I do, I tend to go for odd meals. They don’t always follow the meat and two veggies, plus starch that my mom always made. The other day, I decided to make egg rolls. 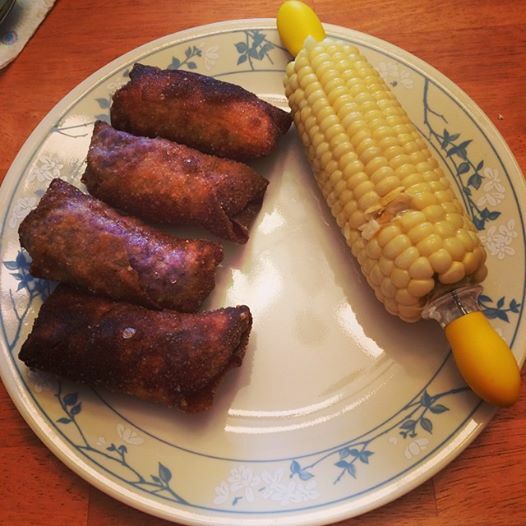 These are my take on egg rolls. I call them American egg rolls because you can really put anything you want in these. This particular recipe is the Asian inspired flavor for egg rolls. I’ve also done a Mexican inspired flavor for these where I take seasoned ground beef, corn, beans, and a bit of cheese and make a Tex-Mex variation. Play with the ingredients however you wish. Use a fairly large stainless steel frying pan for these. Don’t use a non-stick pan. At the temperatures you’re going to have your oil at, there is a risk that some of the chemicals in a Teflon covered pan might leach out. An apron. Or else wear a shirt you don’t care about, but you will get oil stains on it. Tip: I use the TupperWare Chop ‘N Prep Chef chopper to shred the cabbage, carrots and chicken. This is one of the best gifts I’ve ever received. Definitely makes shredding the ingredients really easy and quick. Mix the shredded cabbage and shredded carrots in a bowl. Tip: You will not be using all the cabbage/carrot mixture. Think about splitting this in half and using the reserved 1/2 to make homemade coleslaw. Create an assembly line. Put the wraps first, then, the cabbage/carrot mix in a bowl. Next, Put the shredded chicken in another bowl. Get a bowl of WARM water at the end. Tip: Make sure you keep the water of the assembly process away from your pile of wraps. Remove one wrap from the pile and lay it in front of you as if it were a diamond shape with the bottom pointing at you. Add a heaping tablespoon full of cabbage/carrot mixture to the middle of the wrap. Add a heaping teaspoon of chicken to the pile. Dip your fingers into the warm water and moisten the bottom edges of the diamond. Take the two side points, and connect them together. Take the bottom point and press into the folds of the side points. 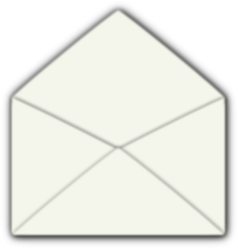 You have now created what should look like an open envelope. Lift this up and gently shake to get all the ingredients below the fold. Then, as tightly (and gently) as you can, roll from the bottom and use a bit of water to seal the top of the envelope. Don’t worry if you rip it. One thing you can do, is seal most rips by moistening the tear and squishing them back together. If you have a really bad tear, you can sacrifice one wrapper to become the “tape” to hold others. Just moisten a strip off of a wrapper and plaster it on top of the tear. Don’t pile assembled egg rolls tightly. They’ll stick together. Fill your frying pan with peanut oil about one inch deep. Try to have a pan large enough that you can fit four to five egg rolls at a time with plenty of room for them to move around. Otherwise, you’ll be frying all night. Heat the oil to the point where a TINY drop of water will fizzle away quickly. Be careful! If you flick too much water in very hot oil, you will hurt yourself. Just drop a bit of water off the tip of your finger to test. If you see smoke on your oil, turn the heat off immediately. Once the oil is hot enough, begin placing your egg rolls. Do this part slowly. Don’t drop them in. You do not want to splash hot oil on yourself. Watch the first batch very carefully. Turn them over when the fried side looks to be getting close to golden brown. Use your tongs to flip the egg rolls and cook the opposite side. Tip: if you see a thin side to the egg rolls, cook that side first, that will help cut down on giant bubbles forming that will make them want to not stay flipped over. If you get an egg roll that keeps trying to flip over, hold it with a fork in the position you need for a few seconds until the air has had a chance to move around and the egg roll no longer tries to flip back over. Once the other half has been fried, use the tongs to remove the egg rolls from the oil. Give it a few seconds above the oil to drain off the oil (turn the egg roll different ways to ensure you’ve gotten most of the oil off) then move to your paper towel covered cake pan. Use the sides of the cake pan so that you can drain the egg rolls by standing them up on end. This helps get most of the oil out. Egg rolls should be golden brown. Apologies on the picture above, I kept getting interrupted on this batch so they got a bit more done than they normally would be – but they were still delicious. Tip: Watch the temperature of your oil. If your egg rolls begin cooking too fast, turn the heat down. Don’t leave these unattended. They can burn very quickly. We like using hot mustard and soy sauce. You can try sweet and sour sauce as well. One last note about the peanut oil. You can re-use this a time or two if you’re going to be frying in the near future (refrigerated biscuits dough make yummy fried donuts). Once you have let the oil cool for a couple hours, you can put it in a container. I suggest taking a large container and using a paper towel to create a sieve. Don’t put the towel on top tightly, let it sag a bit like a bowl so oil can drip through. SLOWLY pour some of the cooled oil into the paper towel sieve. Let that drip down into your container. Seal it tightly and re-use it. If your oil has changed color or overheated, you may not want to do this. Make sure you’re wearing your apron when you do this. I admit it. I look at Pinterest and feel like I should be able to throw together this awesomely amazing birthday party for The Boy in my spare time. Then, I remember I work and don’t have spare time. I do try to do something cute for his birthdays though. We don’t go all out. We only have family over to celebrate. He’ll have a big party with friends in a few years, but right now, we are keeping it small. And it all starts with Halloween. Coordinate decorations between holidays to save time and money. Wait – you say. Why are we mixing Halloween and birthdays? Here’s why. Our church does a Trunk or Treat every year where you decorate your car for the kids to come along and get candy. What I did this past year was use the decorations that I planned on using for The Boy’s birthday in February for the Trunk or Treat car in October. Meaning, I got to re-use this stuff and I only had to make one trip to the party store. Score! How does this work with a toddler’s attention span? By using the same decorations and allowing him to continue playing with them in between Halloween and his birthday, we’ve been lucky enough that he continued to like the idea of having his birthday be the same thing he was for Halloween. We didn’t do this the first two years and it might not be possible this next year, but it’s something to consider if you have an obsessed kid. This past year, we also had our first trip to Walt Disney World with The Boy planned. We knew we’d be there during Mickey’s Not So Scary Halloween Party, so we decided to coordinate Toy Story inspired costumes for the Party, the Trunk or Treat at church, and his birthday. Getting to use some of this stuff three times made my frugal self happy and it made decorating and planning a LOT easier. This is not so much a recipe as an assembly guide. I don’t have time to bake things from scratch. If you’re honest, you probably don’t either. Why? They’re cheap and that means you can fit the entire batch of batter in two pans and not have to bake for twice as long. 24 cupcakes takes just slightly under a 1/4 cup batter each for a typical boxed cake. Refrigerate or freeze the cupcakes while you mix the frosting to make them easier to frost. In a mixer, mix the green dye with your butter cream frosting until you get the color desired. This took about 1/2 tube of the neon green gel for two cans of frosting. 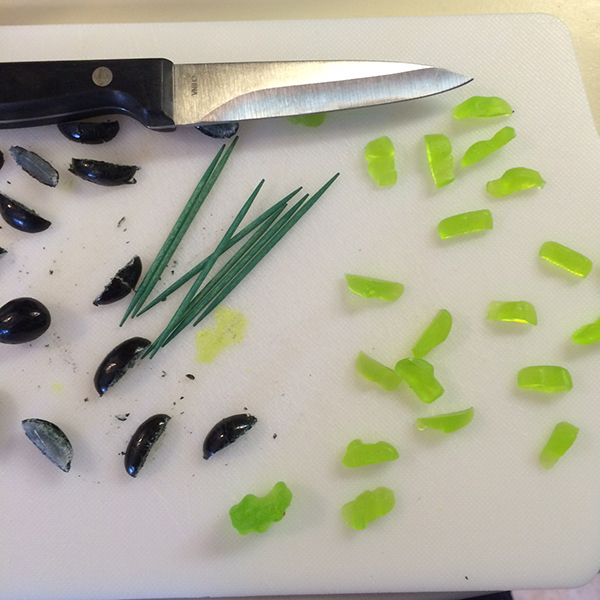 Cut the green gummies into triangular pieces. My gummies were Easter gummies, so they were not very easy to make triangles. I eventually was able to make rectangles and then cut those for the triangle. Cut the black jelly beans into quarters to get as close to a “smile” as possible. Put a bit of gummy on top of the green toothpick. Bonus: this helps keep the top of your container from getting frosting on it. 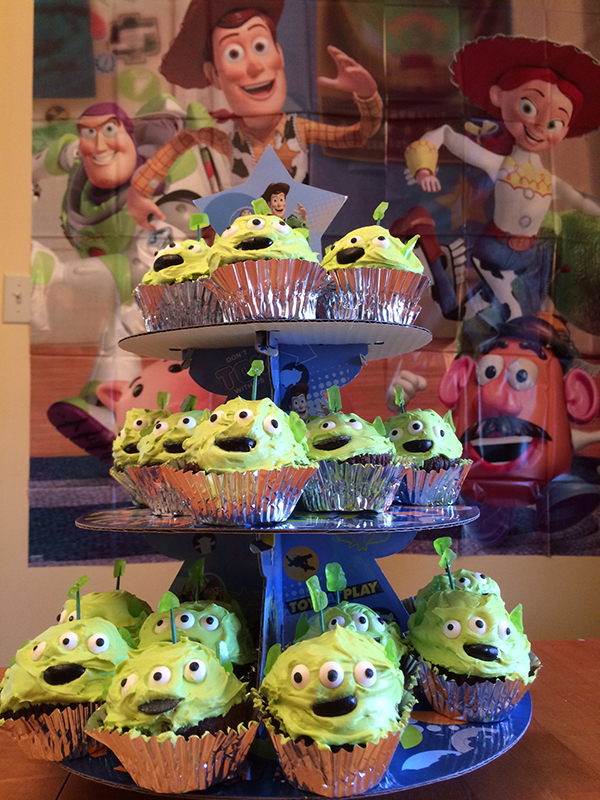 I bought one of those Toy Story cup cake stands, but I think these would have been just as cute lined up in rows. I will say that I was pleasantly surprised with how sturdy this stand was for being only a few dollars. I think it might be worth it, though, to invest in a real cupcake stand for the future. Now that your army is complete, you can take over the world.